You have 16 gigabytes of data and 4.7 gigabyte DVDs. I'll look at the various approaches to splitting that data across multiple discs. My new hard disk is 698GB, and it only has 16.1GB used as I keep all my music, pictures, and so on using a Samsung 2TB eternal USB drive. Is there any way to burn/copy the 16.1GB to several blank DVDs for possible future re-installation of all files, like all Windows XP PRO, Microsoft updates, and so on? Wanting to save a large amount of information across multiple CDs or DVDs is not an uncommon request. Yours is particularly specific and has a pretty clear answer, but as it turns out, the general case of just having "a bunch of stuff" that you want to save to DVDs or CDs is also fairly interesting. I'll start with my recommended approach for your specific request and then branch out into some other alternatives – some even easier – for the more general purpose case. What you've described is actually something that I strongly recommend to people: take a system image backup so that you can restore to that backup in the future should you ever need to reinstall Windows. Restoring to this image backup is typically significantly faster and combines several steps including format, install, and update. So one solution is very simple: use your backup program to make an image backup of the system and select CD/DVD as the output for that backup and the utility will take care of the rest. To be honest, my gut reaction is to question the use of DVDs at all. Small external hard disks – or even flash drives – are inexpensive and might be a more viable approach for this kind of operation. For your specific example, the solution that I'd recommend would be extremely similar to the DVD scenario: use your backup software to create an image of your machine, saving it to an external hard disk or flash drive. It's a single operation without a lot of DVD swapping both at creation time and when the time comes to use the image. 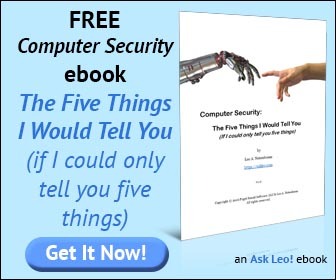 Because you have a backup program (you do, don't you? ), and that backup program knows how to split things across multiple CDs or DVDs, one very practical solution is simply use the backup program for this as well. First, collect the files that you want into a single folder. Instruct your backup program to backup that folder and everything in it, and have it write the backup to CD/DVD. It'll automatically split the backup across as many discs as needed. When the time comes that you need the contents of the discs again, just fire up your backup program and "restore" from the discs. Other popular utilities, like WinZip and WinRar, are apparently also capable of splitting the generated archives into multiple files. Finally, once you have those multiple files, you would then need to burn each of them individually to the appropriate media, be it CD or DVD, using a tool like ImgBurn. To me, it still seems easier to do it all in one step using your backup software. 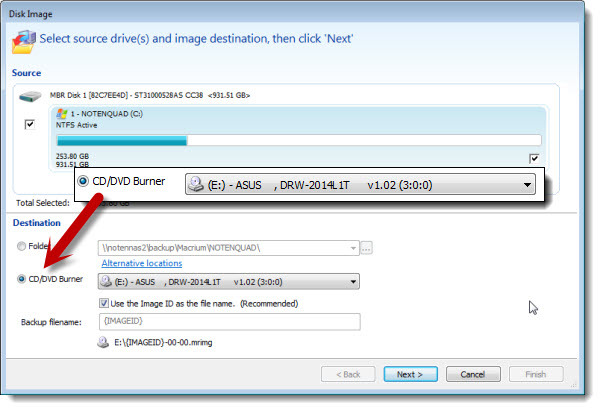 ImgBurn - Free CD/DVD Burning Tool ImgBurn is a free, powerful burning tool that can be used to burn files and ISOs to CD/DVD/HDDVD/Bluray discs, or to create images of them. 7-zip file archiving utility There are many win ZIP archive programs. 7-Zip is free zip software, full featured, compatible and the zip software I recommend. How can I rejoin two files into one? Not only is it possible to rejoin two files into one, you already have the tool on your machine to do so. The other question is, where are the pictures etc. from the external drive backed up? I may be missing the point of this question but the answer is: they're not. Not unless you take steps to back them up somehow. "If there's only one copy, it's not backed up." For the "random collection of files", backup can be a good way to go. However, I would be more selective about the backup program. I would use a 3rd party tool that allows the image backup to be "Mounted" so you can extract individual files. DriveImage XML is one of those tools, there are others. I can see where the OP is coming from. DVD-s are less likely to fail than a hard drive. Since they are light made, magnets can not hurt them either. You just have to be careful not to scratch them or break them. You can even fix small scratches. Then there is bluray for bigger backups.